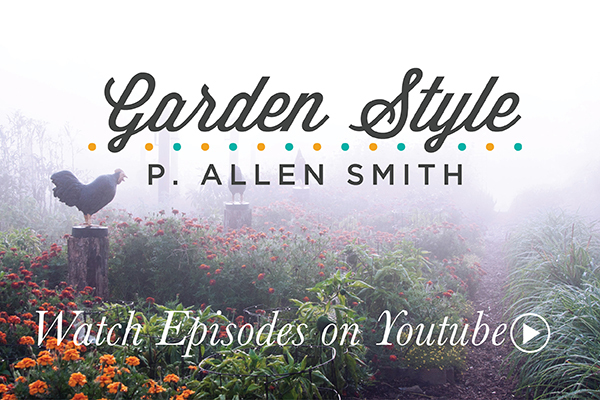 Allen Smith, often described as one of America’s most talented garden designers, is the product of five generations of southern nurserymen. His foundational childhood experiences in planting naturally led to an appreciation for horticulture, genetic diversity, plant pairing and for an orderly and holistic approach to work. Later, as a garden and landscape graduate student in England, his design processes were refined to embrace each site’s unique characteristics and the needs of each unique commissioning family. Eschewing fashion, Mr. Smith identifies and sensitively accentuates the natural gifts of the landscape, imparting balance, harmony and beauty in the classic tradition of Palladio, Brown, Repton and Soane. His designs are an expression of his client’s lifestyle and their legacy–melding site with living material and improvements to create environments that mature and improve with the seasons. And Mr. Smith’s many esoteric interests and insights allow for a myriad of inclusions such as ornamented aviaries, sheep pastures, walled gardens, fruit orchards, kitchen herb gardens, container gardens, stumperies, rare rose collections, wildflower and pollinator fields, apiaries, ponds, and architecturally appropriate built structures and follies. The result for his clients are timeless gardens and landscapes. Health and improving the everyday experience of clients are also central to Mr. Smith’s designs. Often heard describing his approach as “blurring the lines between indoor and outdoor,” Allen organizes and then offers the aesthetic benefits the natural world both from the garden environment and from behind glass by partnering with architects and interior designers. His methodology initially considering a site in context, then he systematically focuses on the subtle, but critical, decisions that cumulatively distinguish an entire environment as exemplary. The particular grade, color and density of crushed stone on a garden path, height and volume of water falling from a fountain, the provenance of garden sculpture, or the history and environmental suitability of specific plant varieties are daily concerns for each project. For Mr. Smith, the details are paramount and distinguish his work. An affable manner, humor and humility has earned Allen long-lasting client relationships that have grown into friendships, often spanning decades, with work for multiple members (and now multiple generations) of large families. Internationally celebrated for his for implementation of the Ferme Ornee form at his own private 600-acre Moss Mountain Farm estate near Little Rock on the Arkansas River, Mr. Smith’s valuable talent set has attracted both private family and corporate patrons. His portfolio includes a diversity of projects: plantations, townhomes, campuses, golf clubs, new town developments and rooftop gardens. In all, beauty, abundance, harmony and nature peacefully coalesce for the benefit of each guest. Mr. Smith’s family imbued him at an early age with an appreciation and love of the land. His passions were further directed at Hendrix College where he received a B.A. with an emphasis in Biology and History and then formalized in the classroom and by experience in England. During his time in Cheshire, Mr. Smith retraced the route, 200 years to-the-day, of Thomas Jefferson and John Adam’s famous tour of important English country homes. Mr. Smith studied the building practices, material use, scale, handcrafts, sensations, and proportions of the subjects of Jefferson’s journal, in addition to many others. And by establishing friendships with the descendants of these homes–Arley, Helmingham, Chatsworth amongst others–Mr. Smith learned first hand the design language of both the classic English garden and the classic English estate landscape. These insights provided a roadmap for his adaptation of enduring design components. Mr. Smith’s American designs are rendered in this unique voice and retain the sensation and grounding of significant precedent. Part of Mr. Smith’s life mission is to share his knowledge and enthusiasm for design and beauty. His generosity of spirit has produced volumes of accessible work for the public. To date, he is the author of six best-selling books, host and producer of one of PBS’s most successful and award-winning television shows, he runs a media enterprise focused on garden design and health, he is a speaker at many of the country’s important architectural and historic homes and opens his own home to the public each Spring and Fall. He is regularly quoted in national publications and was a regular garden contributor on the Today Show and Good Morning America. Mr. Smith’s work has been featured in the New York Times, The Washington Post, Architectural Digest, People Magazine, Elle Decor, House Beautiful, Traditional Home, Southern Living, Southern Accents, Flower Magazine and over 100 additional publication titles. Mr. Smith is deeply passionate and involved with preservation and conservation efforts. In addition to green building and material use in his designs, he is a trustee of Winterthur House, a former board member of the Royal Oak Society (of the British National Trust), is a certified fellow of the Royal Horticultural Society, an honorary member of the Garden Club of America, the Honorary President of the Herb Society of America, and a life member of the Livestock Conservancy, Rare Breeds Trust (UK) and Society for the Preservation of Poultry Antiquities. He is a TEDx speaker and the founder of the Heritage Poultry Conservancy. Mr. Smith makes his permanent home with his partner, two Scottish Terriers, and hundreds of heritage birds in Arkansas, where his voracious appetite for new projects, design challenges and sharing his love of the garden with new friends takes shape at his design studio and farm.